Founders Park is a beautifully landscaped pedestrian mall designed around Purdue’s historical Loeb Fountain, an interactive water sculpture. Dedicated April 23, 1994 during Purdue’s 125th anniversary year, the park is larger than two acres and includes walks, trees, tables, seating, lighting, and retaining walls. 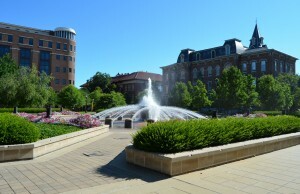 The Loeb Fountain, originally located in front of Hovde Hall, is now the centerpiece of Founders Park. It can recycle up to 2,200 gallons of water per minute. Founders Park is named in recognition of the students, faculty, administrators, trustees, and benefactors who helped nurture the University in its early years.